"High-Definition Television: The Reality behind the Hype." Speech delivered at the annual meeting of the Consumer Electronics Association, San Diego, California, December 15, 1997. A look behind the scenes of the newly emerging high-definition TV bells and whistles. "Picking the Piano Player: Policy Implications of a Probable Clinton Administration." Keynote speech at the annual meeting of the Fahnestock Group, Princeton, N.J., October 23, 1992. A pre-election look at the presumed public policies of a Clinton Administration in Washington. "Capitalism: Designing the Future." Keynote speech at the annual meeting of the Foundation for Student Communication, Atlanta, Georgia, October 9, 1992. What capitalism has to do to retain a competitive political edge in the new century. "China: Some Unconventional Wisdom." Speech at the Trenton Club, October 7, 1992. Demythologizing the media hype and exaggerated expectations regarding China. "The American Economy in Structural Transformation." Keynote speech at Austin College, Sherman, Texas, for the annual Owens Conference, October 1, 1992. Structural transformation in the U.S. market from an old industrial age to a new information economy. "Shifting Patterns in Foreign Direct Investment." Panel presentation at the Office for Technology Assessment (OTA), Washington, D.C., September 11, 1992. A look at changing patterns of foreign investment in the U.S. and U.S. investment overseas. "Shifting Power Relationships in East Asia." Speech at the Johns Hopkins School for Advanced International Studies (SAIS), Washington, D.C., August 17, 1992. A focus on the U.S., China, and Japan in the context of a changing economic and political environment in the Far East. "American Politics in the Global Arena." Speech on behalf of Institutional Investors at their annual Global Investing Conference, Tokyo, Japan, June 9, 1992. A focus on the policy ramifications of the Clinton, Bush, and Perot campaigns. "Beyond Japan-bashing: Revitalizing the American Economy." Speech at Tsukuba University's Panel on U.S.-Japan Relations, Tokyo, Japan, June 3-5, 1992. Tax incentives and other public policy innovations necessary to revitalize America's economy. "New Strategies for the New Century." Keynote speech for the annual meeting of the U.S. Business & Industrial Council, Sea Island, Georgia, May 21, 1992. New corporate sector and public policy strategies to keep America on top in the new century. "Asia's New Little Dragons." Keynote speech at Oklahoma State University to commemorate their new World Trade Center building, April 2-3, 1992. A focus on the dynamic, emerging economies of Indonesia, Thailand, and Malaysia. "Financial and Political Scandals in Japan." Speech at the Library of Congress on behalf of the Congressional Research Service, Washington, D.C., April 16, 1992. An inside look at Japan's hidden liabilities in the context of the new decade. "The Challenge of Choice in Public Education." Public policy panel for Citizens for a Sound Economy, New Brunswick, N. J., April 8, 1992. A focus on successful choice plans in public education around the country and their relevance to New Jersey. "Economic Empowerment Strategies in Public Policy." Speech at the Rockefeller Foundation, New York, March 30, 1992. Incentive-based policies to encourage economic empowerment in social policy as an alternative to government-dependency. "The New American Century." Keynote speech at Trinity University, San Antonio, Texas, March 23, 1992. Corporate strategies and public policy innovations necessary to keep America in the lead in the new century. "Asia's New Little Dragons." Speech at the National Defense University, Washington D.C., March 12, 1992. Focus on Indonesia, Thailand, and Malaysia in the context of changing defense and security relationships in Southeast Asia. "New Strategies for Competing with Japan." Speech for Anchor-Hocking Corporation at the annual operations meeting of the Newell Group, Amelia Island, February 24, 1992. A focus on product quality and ceaseless attention to detail in service. "Shifting Power Relationships: The U.S., China, and Japan." Central Intelligence Agency, Washington, D.C., January 15, 1992. A focus on the changing economic relationship between the U.S. and Japan, and the strained U.S. political relationship with China. "Asia's New Little Dragons." Luncheon speech at the annual meeting of the American Indonesian Chamber of Commerce, New York, December 17, 1991. Discussion of Indonesia, Thailand, and Malaysia as Asia's fastest growing new economies. "Competing with Japan in the Post-Cold War Era." Keynote speech for the Central California Civic Association, Fresno, November 20, 1991. Discussion of corporate strategies and public policy incentives needed to compete more effectively with Japan in the decade ahead. "New Directions for the New Economy." Keynote speech at the annual meeting of the Business & Industrial Furniture Manufacturers' Association [BIFMA], Fort Myers, Florida, November 7, 1991. Economic transformation in the U.S. from a manufacturing-based industrial age to a value-added, service-based information economy. "Global Markets: A Focus on the Future." Keynote speech for the World Trade Association, Denver, Colorado, October 17, 1991. East Asia, Eastern Europe, and the 3rd World, with a predominant focus on China and Japan. "New Incentives in Public Policy Innovations." Speech at the New Jersey Builders' Association regional meeting, Woodbridge, New Jersey, September 16, 1991. A look at the pros and cons of basing public policy innovations on incentives rather than on politics. "New Directions for the New Economy." Corporate seminar for AT&T at its Center for Executive Education, Palm Beach, Florida, May 22, 1991. Economic transformation in the U.S. from manufacturing-based industrial age to value-added, service-based information economy. "Competing with Japan in the Post-Cold War Era." Luncheon speech at the Manhattan Institute, New York, March 6, 1991. Discussion of corporate strategies and public policy incentives needed to compete more effectively with Japan in the decade ahead. "Japanese Investment in the American Midwest." Presentation for the Chicago Council on Foreign Relations, February 28, 1991. Discussion of growing Japanese manufacturing investment in the Midwest U.S., disaggregated by industry and by state. "Defining Change: New Directions for the New Age." Presentation for IBM at its Higher Education Executive Conference, Orlando, Florida, February 25, 1991. Trend analysis of social and economic trends through the 1990s. "New Directions for the New Economy." Keynote speech at the Stevens Institute of Technology, Hoboken, New Jersey, February 14, 1991. Discussion of new trends in the U.S. economy for SIT's annual faculty meeting. "Nihon wa sekai no riidaa ni nareru ka?" [Can Japan Really Be a Global Leader?] 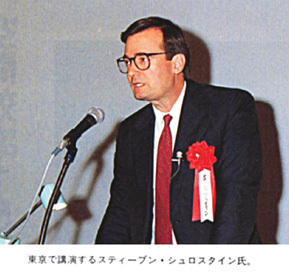 Speech (in Japanese) for Landor Associates forum on Image Power, Tokyo, November 27, 1990. Subsequently reprinted in Japan, together with a lengthy excerpt from the Japanese edition of The End of the American Century, in President Magazine, Tokyo, January 1991. "Global Markets: A Focus on the Future." Corporate presentation for senior executives of Bell Communications Research (BELLCORE), Lisle, Illinois, November 19, 1990. "The U.S. and Japan in Indonesia: Sharpening our Competitive Edge." Presentation for a conference on investment incentives in Indonesia sponsored by Harvest International, Washingon, D.C., May 22, 1990. "The New McCarthyism." Speech for the Dallas Council on World Affairs, Dallas, April 19, 1990. Revisionism vs. apologism in the U.S.-Japan debate; incentives for change and new policy directions. "New Strategies for the New Era." Speech at the Nassau Club, Princeton, April 29, 1990. Decentralization as key to American leadership in the emerging information age; defining leadership for a new American era. "Beyond 'Revisionism:' Being Realistic About Japan." Speech at the Carnegie Council on Ethics and International Affairs, New York, April 11, 1990. On the need for greater realism in America's Japan policy. "Beyond the Cold War: Being Realistic About Japan." Speech at the National Conference for Editorial Writers, Washington University, St. Louis, March 27, 1990. The changing geopolitical environment in Japan & Europe. "The U.S. and Japan: Unhappy Marriage or Inevitable Divorce?" Speech for the Princeton Area Chamber of Commerce, Princeton, March 1, 1990. Outlook for the future of the U.S.-Japan relationship. "Beyond the Cold War: Coping with Japan." Speech and related seminar for the Chicago Council on Foreign Relations, Chicago, February 12, 1990. Outlook for the future of U.S.-Japan relations. "America's New Manufacturing Strategies for East Asia." Speech at the National Association of Manufac-turers annual meeting, Boca Raton, February 10, 1990. Implications of economic, social, and political change in East Asia for American corporations; focus on incentives needed in the U.S. tax code for new investment spending. "Looking Back from the Year 2001: Reflections on the New Century." Speech at the annual meeting of the Western Michigan Area Chamber of Commerce, Grand Rapids, Michi-gan, November 28, 1989. Futuristic themes, broadly gauged, from the prologue of The End of the American Century; looking ahead to global competition in the new century. "The Hundred Years' War." Speech delivered at the 1989 annual meeting of the Construction Industry Manufacturers' Association, Orlando, Florida, November 17, 1989. A look at the continuing and intensified competition between the U.S. and Japan in the value-added manufacturing sectors.